Ritsu Tainaka wants to reform the light music club which will be disbanded by the end of April if at least four members cannot be found. They put up a poster for the club which catches the eye of Yui and she submits a form to join the club. 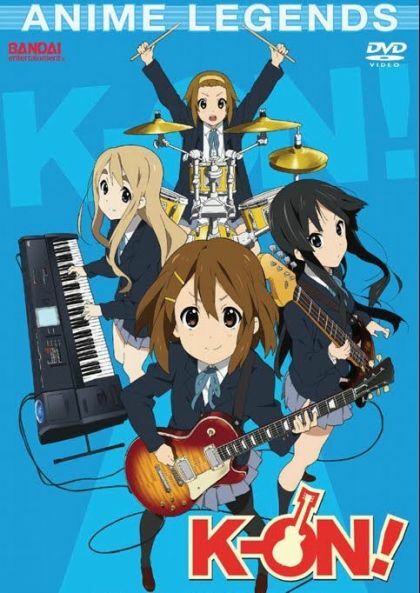 The three members perform a short piece for Yui; this inspires Yui to finally join the club as a guitarist, though she first not only has to buy one, but learn how to play it first. Ui remembers how Yui once attempted to give her a white Christmas by sticking pillow stuffing on the tree outside. Ritsu decides to hold a Christmas party for the club, and while her initial plans of holding it at Tsumugi's house fail, they eventually decide to have it at Yui's house, also inviting her friend, Nodoka Manabe. They also decide to do a gift exchange, and go shopping for various gifts. Ui prepares a lovely Christmas dinner for the group, which gets a little out of hand when Sawako shows up out of no where. During the gift exchange, Yui and Ui give each other some warm things for the winter. After the rest of the group leaves, snow falls and Yui and Ui decide to sleep together, although Yui ends up hogging the sheets. In the New Year, the club decides to go to the shrine to make their New Year wishes. Azusa meets up with Ui for lunch and are later joined by Ritsu. They try to call Tsumugi but end up talking to her butler. Yui and Ritsu invite Sawako to join their next training camp, but she appears disinterested. The gang arrive at an even bigger villa than last year, though Mugi points out it still isn't the one she desired. Yui and Ritsu want to play and Mio and Azusa want to practise, but the latter gets outvoted by Tsumugi in favour of playing. Azusa objects, but ends up having the most fun anyway, even getting sunburnt in the process. After practise, dinner and fireworks, Ritsu suggests a test of courage, and Mio and Azusa are shocked by the sudden appearance of Sawako. Later that night, Azusa joins Yui practising guitar. Azusa meets up with Ui again, although she can barely recognise her with all the sunburn. When Ritsu is reminded by Nodoka to fill in her gym-use application, the band notice they don't have a name yet. Azusa notices rust on Yui's guitar strings, and it becomes apparent that Yui has never given her guitar maintenance before. They take it to the guitar shop where Mio gets entranced by a Lefty fair. However, Yui doesn't realise she has to pay for maintenance, and when Tsumugi tries to pay, the staff refuse to take money from her. They tell her to consider it as a free service. Later, Ritsu starts to become jealous of Mio spending time with Nodoka and begins to fall out with her. She ends up with a fever, so Mio visits and smoothes things over. Afterwards, Ritsu gets in trouble for still forgetting her form, but Nodoka backs her up. Since none of the members could decide on a name for the band, Sawako chooses the name "After School Tea Time" to get it over with. However, Yui ends up catching Ritsu's cold. As the cold winter weather creeps in, and despite Yui's offer of having nabe with everyone, each of the club members have individual duties. Tsumugi gets a part time job at a fast food restaurant, Mio goes to the beach to get inspiration for her lyrics, Ritsu has to entertain her little brother and Azusa is asked to look after her classmate's pet cat, despite not being good with cats herself. However, Mio cannot think of anything to write, Tsumugi buckles under the pressure, Ritsu ends up by herself and Azusa is left uncertain what to do when the cat starts throwing up. A random text from Yui cheers up the others and she comes to help Azusa with the cat. They all meet up for burgers where Ritsu is shocked to find what she thought was a love letter addressed to her was actually a set of lyrics Mio wrote. Yui and the other girls start their third year at high school (Azusa's second). Yui, Mio, Ritsu and Tsumugi are surprised that they, along with Nodoka, have been put into the same class. It soon becomes apparent that their new homeroom teacher, none other than Sawako, had arranged it that way so she had fewer names to remember. With Azusa being the only second year of the light music club, the gang become determined to get new members so that she will not be the sole member when they graduate. However, their various attempts to attract new students fail, so they focus instead on their performance for the freshman reception. Azusa becomes depressed that no new members show up afterward, but after talking with Ui and Jun and overhearing Yui's comments, she decides it is fine with just the five of them for now. While clearing their personal belongings out of the club room, the girls find an old guitar that used to belong to Sawako. Since it had aged a bit, Sawako allows the girls to sell it and add the money to the club's budget. After visiting a home superstore to buy a storage shelf, they take the guitar to the music store where they are surprised to find it valued at ¥500,000. When Sawako inquires about the sale, Ritsu tries lying about its value, but it backfires when Sawako asks for a receipt and the club end up getting considerably less money. However, she allows the girls to buy one thing with the money. Noticing that Azusa looks a bit concerned about not having any freshmen to look after, the girls decide to get her a pet turtle named Ton. After noticing how badly she shows up in videos of the band's performances, Ritsu decides she does not want to be the drummer anymore as she does not stand out enough. She tries playing the guitar but cannot get beyond the basics. She tries the keyboard next, but only goes as far as playing with all the sound effects. The next day, Yui tries coming up with various ways to make Ritsu stand out, with no such luck. Later that night, Ritsu recalls when she first started drumming and practicing every day. After watching a DVD of The Who, she realizes that even though she is not always in the spotlight, she loves playing the drums. The next day, Tsumugi shows off a new song that Ritsu helped her come up with. Azusa and Ui, along with their classmate Jun, spend time together while the third years are on their trip to Kyoto. Noticing that Ui would be lonely without her sister around, Jun and Azusa decide to sleepover at her house, in exchange for Azusa helping out with her underclassmen in the jazz club. After spending the night, they wake up to a rainy day. They go to an arcade where Ui hits a home run in a batting game, before Azusa is reminded that she needs to feed Ton. While in the music room, the three decide to have a jam session together. The other girls return the next day and give Azusa a keychain, one of a set that spells out 'light music club'. On a very rainy day, Yui gets completely soaked trying to keep her guitar from getting wet. While Yui lets her clothes dry, she temporarily wears a maid costume made by Sawako until she gets told off about it. Azusa later helps Yui maintain her guitar. When it continues to rain the next day, the others recommend Yui keep her guitar in the clubroom overnight, though it causes her to worry late at night. The following day, Yui is so overjoyed to be reunited with her guitar that she brings it to class, but Sawako tells her to put it away. During an unbearably hot day, the girls have trouble beating off the heat and also notice Ton shedding in its current aquarium tank. After dragging Sawako away from the air-conditioned staff room (partly to give Tsumugi a ride back to her house to get a bigger tank for Ton), the girls wonder why the club room does not have an air conditioner. After inquiring with Nodoka about it, it turns out that Ritsu never sent in a request for an air conditioner due to her never attending any student council club meetings. After pleading to the student council, the club room gets one installed. However, Yui slumps over, having forgotten that she weak to air conditioning. With the other girls studying for their exams, Azusa hangs out with Ui. Throughout the day, Azusa spaces out and has weird dreams concerning the other girls. Later, Azusa, Ui and Jun go to a swimming pool, where Jun starts to regret not joining the light music club. Afterwards, they run into Yui and the others for real and they all go to a summer festival together before Azusa, Ui and Jun lose them in a crowd. Jun mentions that she might join the light music club if they cannot get any other members by next year. At the end of the day, Azusa worries about being all alone and promises to make the upcoming school festival performance a success. Upon returning to school after summer vacation, the girls learn of a school-wide marathon, which Yui is not keen on participating in. Seeing the marathon course while riding in Sawako's car does little to make her look forward to it. During the marathon, Yui constantly gets distracted and later everyone starts getting tired, trying to come up with various ways to keep them motivated. After reaching the top of a steep hill, the girls discover Yui has gone missing and go search for her. When Ui hears about this, she deduces that Yui had been staying at the old lady's house after scraping her knee. At the final stretch, Yui assumes that there will not be a rice cake for the person in last place, causing everyone to make a dash for the ending, resulting in Mio, who did not want to finish last due to it being embarrassing, performing an extravagant roll upon tripping at the finish line. While everyone enjoys red bean soup and rice cakes, Sawako is still searching for Yui. When Azusa comes to the realisation that the light music club has been slacking as of late, she becomes determined to practice more. Azusa runs into Tsumugi alone in the club room and tries giving her some guitar lessons. She later is about to get a chance to practice alone with Mio, but is interrupted when Ritsu requires help from Mio and the girls end up spending the evening at Ritsu's house. The next day, Azusa runs into Yui in the club room hoping to practice, but ends up cleaning Ton's tank and helping her with understanding how to play the song Tsumugi composed, as she cannot read sheet music. Yui reminds Azusa that she is who she is, and personalizes her keychain. The club room is closed for repairs, leaving the girls nowhere for practice. While trying to find a suitable location for their practicing, the girls try to come up with lyrics for the song Tsumugi wrote. Failing to find anywhere in the school to practice, they rent out a studio, but end up wasting time discussing lyrics and run out of time before they can practice, though the club room reopens the next day. The following night, Ui helps Yui write some lyrics, but ends up catching a cold, leaving Yui, who has always relied on her, to look after her instead. Realizing how important she is to her, Yui writes some lyrics dedicated to Ui, which are approved by the other club members.